Lightly steamed spinach and toasted English muffins topped with eggs over easy, generous dollops of Hollandaise Sauce, and served with potato puffs and fresh fruits. All Kiloran Farm breakfast meals are served with your choice of piping hot coffee, tea, or hot chocolate, and freshly squeezed orange and apple juice. 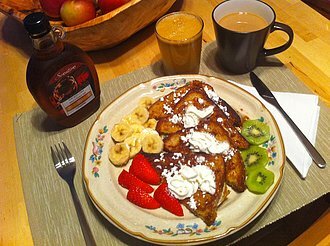 Multi-Grain French toast served with cinnamon, fresh fruits, whipped cream and pure maple syrup. 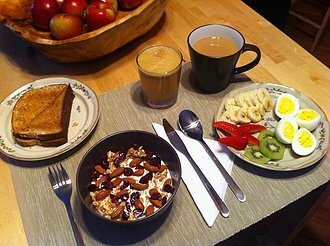 Crunchy Muesli served with generous helpings of almonds, pumpkin seeds, and dried cranberries, fresh fruits, hard-boiled eggs, multi-grain toast and an assortment of specialty jellies and jams. All Kiloran Farm breakfast meals are served with piping hot coffee, tea, or hot chocolate, and freshly squeezed orange and apple juice.